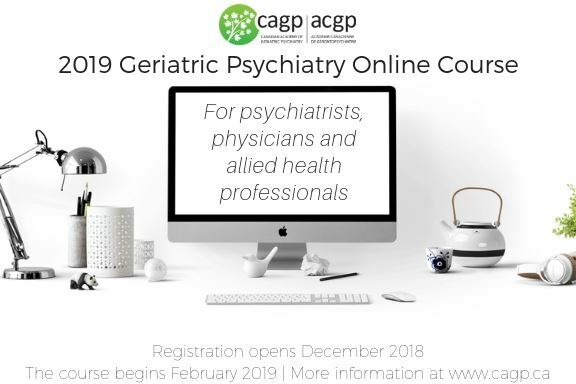 The 2019 Geriatric Psychiatry Online Course will help you update and consolidate your knowledge of a broad array of geriatric psychiatry topics in an innovative, interactive and fun manner. Our program is an interactive asynchronous online learning opportunity (sign on at your convenience) and is geared toward psychiatrists, physicians and other health professionals who are interested in receiving up-to-date information about the psychiatric care of older adults, and in interacting with colleagues about the complex issues which arise. This three month course, comprised of 13 one-week modules, is led by expert internationally-recognized faculty and covers a wide array of topics in geriatric psychiatry at an advanced level. Five course modules will feature an added bilingual component (with the option to have discussions en français), thanks to the facilitation of Dr. Jean‑François Côté, Dr. Julie Thériault and Dr. Soham Rej. We have also expanded our committee to ensure that the content and delivery are relevant to physicians and other health care providers beyond geriatric psychiatrists. Dr. Peter Chan, Dr. Meagan MacNeil, Dr. Cindy Grief, Dr. Andrea Moser, Melissa Turzanski, Dr. Robyn Waxman, Dr. Andrea Iaboni, Dr. Benoit Mulsant, Dr. Carole Cohen and Dr. David Conn. Please note, participants will receive their log-in information prior to the course start date. Please email cagp@secretariatcentral.com to add your name to a wait list. The discount is not available for registrations after February 4, 2019 (when the course begins). Cancellation Policy: cancellations will only be accepted on or before January 28, 2019. No credits or refunds will be given for cancellations received after January 28, 2019. Substitutions may be made at any time. No liability is assumed by the CAGP for changes in program dates, content, speakers, or cancellation of the event.